During the 18th century the majority of violin makers across Europe had followed Amati or Stainer, with only a handful pioneering Stradivari’s models, as we saw in part 1. By 1800, however, there was a clear trend towards adopting the forms of both Stradivari and Guarneri. Over the course of the 19th century many makers attempted to reignite the magic of Cremona – and the further from it in distance and time, the more abundant and exact the copying tended to become. French luthiers led the way. By the late-18th century many classical Cremonese masterpieces had made their way to France through collector–dealers such Luigi Tarisio, and soloists such as Giovanni Battista Viotti, as well as through the looting of Italy during the French Revolutionary Wars. French musicians and violin makers must have quickly observed that these Cremonese instruments were superior to those of Stradivari’s French contemporaries such as Claude Pierray and Jacques Boquay, as well as later 18th-century makers such as Louis Guersan and Jean Baptiste Salomon. The transition took place in the early 1790s, headed by François Pique, Joseph Bassot and Nicolas Lupot, who definitively brought French lutherie out of the ‘vieux Paris’ style by producing high-quality Stradivari copies and, in the case of Lupot, some of ‘del Gesù’. They were followed in the 19th century by Jean Baptiste Vuillaume, who also occasionally made Amati and Maggini copies, and Georges Chanot I, who seems to have concentrated exclusively on Strad and ‘del Gesù’ models. 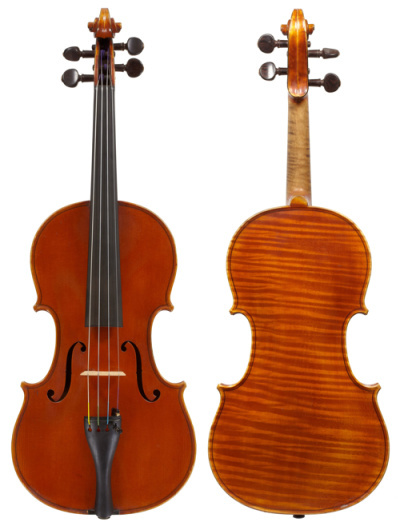 The distinction between copying and being influenced by a particular style becomes apparent here, as these makers were not freely interpreting Stradivari‘s models as was commonplace in Italy, but attempting to imitate him directly. By the mid-19th century the skill of Vuillaume in particular had advanced to such an extent that some have even suspected that Stradivari’s 1716 ‘Le Messie’ violin is a Vuillaume forgery. 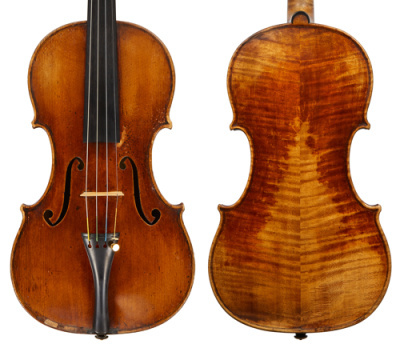 Unlike most earlier French makers, who made no attempt to copy the work of Guarneri ‘del Gesù’, Vuillaume and Chanot made copies of both Cremonese masters, with those of ‘del Gesù’ being the most highly valued. A similar transition was happening in Austria. Franz Geissenhof, a contemporary of Pique and Lupot, shifted from copying Stainer to Stradivari around 1800 and strongly influenced the 19th-century Viennese school that followed him. His Strad copies are rather stiff but compare favorably to those of his French counterparts. Geissenhof taught Jean Baptiste Schweitzer, a Hungarian contemporary of Vuillaume, who in turn taught some important makers of the Hungarian school such as Gabriel Lemböck, Anton Sitt, Samuel Nemessányi and his eventual successor, Thomas Zach. Certain skilled makers of the Schweitzer school, unlike the French, acquainted themselves so closely with the work of Strad and ‘del Gesù’ that some of their instruments appear to be forgeries, not mere copies. It is possible that the cleverest of these makers would make two distinct types of instrument: straight copy and fake. In forging, the maker would avoid using his own trademarks and would aim to reproduce the original label perfectly. This can complicate the process of determining the actual authors of these fakes. German and English makers shared the 19th-century mania for copying and forgery. In England John Frederick Lott II excelled at copying ‘del Gesù’. However, it would not be until the next generation that makers emerged in those two countries who produced copies so accurate that even seasoned experts of the day had to be on their mettle to discern them. In particular the Voller brothers of London and Michael Doetsch of Berlin stand out. 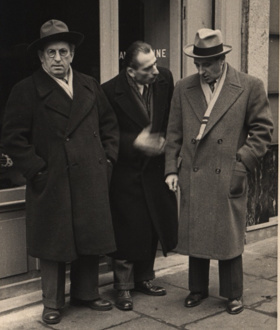 The Vollers were prolific copiers, using Cremonese, Milanese and Neapolitan models. At times these have been successfully passed off as originals and their work has been considered dangerous. However, on serious scrutiny their varnishes fall short of the originals and their wood choices usually betray them. Their instruments capture some of the idiosyncrasy of the originals, but they lack the classical Italian flair and spontaneity. Yet they are intriguing works, reflecting intelligence and a profound understanding of the originals. Doetsch seems to have practised straight copying, applying his own labels and brands. His instruments are of a good quality typical of many 19th-century German and Czech masters. However, justly or not, he too acquired the treacherous reputation of occasionally making a fake Cremonese instrument. By the later 19th century the Stradivari influence had spread to other European countries (excluding Italy), leading to a grand-scale commercialization of golden period Cremona. Violin making centres in Mirecourt, Mittenwald and later Markneukirchen, as well as other towns in Germany and Czechoslovakia, turned out thousands of handmade but mass-produced Stradivari and ‘del Gesù’ models every year. This lasted until well into the 20th century, when first Eastern Europe, then Asia virtually replaced mass production in Europe. By then the vast majority of these instruments were Strad models of various grades. Meanwhile in 19th-century Italy the first generation of what can be termed the Renaissance of Italian violin making laid down solid foundations for the 20th-century Italian school. The Italians who flourished between around 1860–1930 were responding to a newly found international demand – their market greatly aided by the fact that Italian instruments were associated with high quality and individuality. These makers all established a new way of making within their region and most were followed by stylistic successors. While embracing basic classical Cremonese and Guadagnini principles, they tackled copying liberally, and their uninhibited approach to modeling, varnishing, arching and even details such as purfling generated a tremendous diversity in their work. In this way the modern Italians differed little from their forefathers. Among them were some of the most innovative violin making minds, whose best instruments are highly prized for their charisma and skill, despite not necessarily having achieved wide popularity or exerting any obvious influence on future makers. Carlo Giuseppe Oddone and Enrico Marchetti in Turin immediately spring to mind, with their fine and fanciful improvisations on the models of their regional prototypes combined with very personal interpretations of Strad and ‘del Gesù’. There were a few others of even more striking individuality, such as Giuseppe Tarasconi in Milan, Enrico Clodoveo Melegari in Turin and Valentino de Zorzi in Florence, whose models are so highly characteristic and personal that one would have trouble determining which prior maker influenced them. Perhaps the most influential of this group were some of the best-known names in modern Italian violin making: Riccardo and Romeo Antoniazzi, Stefano Scarampella, Vincenzo Postiglione, Enrico Rocca, Giovanni Pistucci, Annibale Fagnola, Augusto Pollastri, Eugenio Degani, Cesare Candi, Gaetano Sgarabotto, Giuseppe Pedrazzini and Celeste Farotti. Each of these had a following of younger makers working well into the 20th century. They were all excellent craftsmen and strong individualists, who preferred to adhere to local tradition or develop their own exemplars, based on those of the best of their respective town’s violin making. They would skilfully blend this with the key elements of classical Cremonese modeling, incorporating only the essential characteristics associated with the great makers, such as their soundhole pattern and corner length, while leaving practically all other features to their own aesthetic sense. Above all, they put their own ideas ahead of anybody else’s. Giuseppe Fiorini and Leandro Bisiach deserve special note. 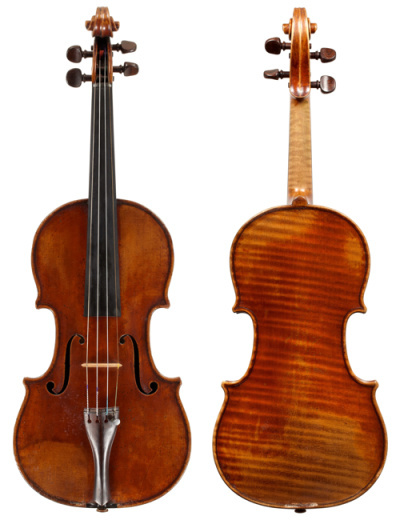 Fiorini was perhaps the first Italian maker to have become as obsessed by Stradivari as Vuillaume had been. Possibly in an effort to underline his interest and set himself apart from his compatriots, he purchased the remnants of the della Valle collection of tools and relics of the Stradivari workshop (formerly owned by Count Cozio, this was the same collection accessed by G.B. Guadagnini). But even he would practice his art mostly outside Italy, in Munich and later in Zurich. Fiorini, though he had few pupils, taught Ansaldo Poggi and influenced Simone Fernando Sacconi, the two most prominent violin makers of the following generation. 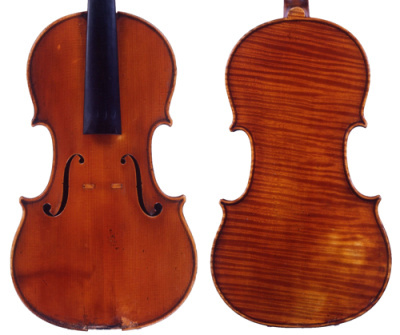 While Fiorini focused on Stradivari and Guarneri, Bisiach developed his own ‘anti-Stradivarian’ model far more based on the grand-pattern Amati. This may be interpreted as his way of perceiving himself as yet another mythical pupil of Amati, rather than a slave to the Stradivari model. Both makers appear to have wanted to recreate what they imagined classical Cremonese instruments had looked like when new. Perhaps they could be seen as the first neo-classical violin makers, who inspired a newer generation to copy the old masters exactly, while adding their individual marks within the comparatively rigid copy framework. This is a very different approach from making bench copies of specific classical instruments or closely imitating a style associated with a period of that maker’s work, and often resulted in giving the instruments a truly old appearance. Bisiach, like Vuillaume, wanted to achieve a marketable, older look for his new instruments, based on classic Cremonese models but without the dedicated antiquing processes exemplified by makers such as the Voller brothers and later Sacconi. His artificial shading mainly affected the varnish of the backs of his instruments and generally did not attempt to recreate the appearance of 200-year-old instruments. Crafting an exact copy is extremely time-consuming compared with making instruments only inspired by a prototype, with a hint of tasteful varnish imitation. Both Vuillaume and Bisiach, in particular, simplified much of this process to create an economically viable solution that would still be attractive to musicians who wished they could afford an old Cremonese instrument, or to those who wanted a second instrument that was superficially similar in appearance to their prized older one. Some of Vuillaume’s best copies were of specific classical Cremonese violins owned by the greatest virtuosos of the era, such as Paganini and Alard, and these may well be the first recorded instances of players commissioning a maker to copy their instruments. Sacconi’s teaching, coupled with research that helped reveal the classical Cremonese makers’ working methods, encouraged contemporary makers to apply themselves to the craft of strict imitation, often down to the minutest detail. The other four stopped well short of bench copying and the artificial ageing of the varnish; they derived their models either from Stradivari, Guarneri or from the Amatise Stradivari instruments, altering these to their own preferences at will. Of course many other excellent violin makers worked – and continue to work – in the traditional Italian style, defined by a yearning towards artistic expression within the confines of the classical Cremonese patterns. However, the most successful makers, regardless of nationality, region or period, are those who embrace the irresistible influence of Cremona, but avoid the stiffness of the mechanical copies of Cremonese instruments. The work of the best makers past and present exhibits the fluidity and grace of the greatest Italian masterpieces, and their multi-layered, translucent varnish reflects a depth of color and texture; it glistens like a mountain brook, rather than with the lifeless shine of glass. * See Dmitry Gindin’s two-part feature on Simone Sacconi.